The impact of the Diaoyu Islands dispute on China-Japan ties is diminishing, but pessimism over future relations remains, the latest public opinion poll in both countries showed. A majority of the public continued to see the significance of the relationship but "the proportion of such people is shrinking to a record low on both sides" - 65 percent of those polled in China and 70.6 percent in Japan. The 10th Public Opinion on China-Japan Relations 2014 survey, co-sponsored by China Daily and the Japanese nonprofit think tank Genron NPO, was released in Tokyo on Tuesday. The latest poll follows two years of global attention on security policies and territorial disputes between Asia's two largest economies, as well as Tokyo's official positions regarding its wartime atrocities. The annual poll, conducted in July and August this year, gathers responses from a wide spectrum of society. In China, the survey included 1,539 Chinese residents in the major cities of Beijing, Shanghai, Chengdu, Shenyang and Xi'an, 201 international relations scholars from around the country and 813 university students and faculty members at five top Beijing universities. In Japan, respondents included 1,000 members of the public and 628 intellectuals, mostly with experience of China. Observers said the poll reflects that rational responses to differences are spreading, and that will create a more favorable climate for thawing ties. The 10th Beijing-Tokyo Forum, co-hosted annually by China Daily and Genron NPO, will be held in late September in Tokyo. Li Wei, director of the Institute of Japan Studies under the Chinese Academy of Social Sciences, said that the past decade covered by the survey and the forum has witnessed "a period of transition of the China-Japan relationship" as well as "a decade of drastically changing mindsets on both sides". "We are going through a test from the transition of a time when a record number of issues broke out simultaneously and overlapped each other," Li said. When asked about the largest stumbling block for the relationship, both the Chinese and Japanese public named the islands dispute as their top concern, yet the portion in both sides shrank this year - 64.8 and 58.6 percent, respectively, from 77.5 and 72.1 percent last year. Chinese respondents said "the lack of political mutual trust between the Chinese and Japanese governments", "the issue of Japan's outlook on its history and education" and "disputes over maritime resources" were also their major concerns. 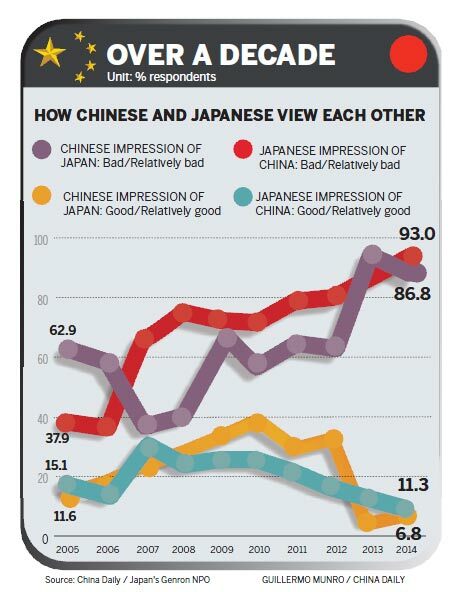 Japan's image in the eyes of the Chinese public has "slightly improved" in the past year because the portion of Chinese people having a "bad" or "relatively bad" impression about Japan dropped by about 6 percentage points from the previous year to 86.8 percent of those polled. But in Japan, the corresponding figure hit a record 93 percent this year. Kevin Jiang, vice-general manager of market research consultancy Horizonkey Information and Data Co Ltd, said: "Compared with the large number of Japanese people who harbor ill-will toward China, Chinese people are relatively more rational." In China, the Diaoyu Islands dispute topped the list when Chinese respondents were asked what first came to mind regarding the bilateral relationship - 46.6 percent of those polled thought about the dispute. In Japan, air pollution topped the list for the first time. The environmental concern was first on the minds of Japanese respondents at 41.2 percent of those polled, surpassing the idea of Chinese cuisine. The dispute over the islands ranked third for them. Yasushi Kudo, president of Genron NPO, said: "The ups and downs of bilateral relations in the past decade have swayed the two peoples' feelings (toward each other's nation). The ties should be lifted out of confrontation. "Efforts should be made for dialogue and communication in a healthy way," Kudo said. "It is important that both Chinese and Japanese people have realized the lack of communication and trust between the two governments." "The opinion polls, which have been conducted consecutively for 10 years, mirror the will of the two peoples and serve as an important channel to understand each other," said Zhu Baoxia, secretary-general of China Daily, at the press conference in Tokyo on Tuesday. In terms of the future of the relationship at the official level, 36.8 percent of the Japanese respondents said it will continue to deteriorate, and only 8 percent said ties will improve. The Chinese respondents had similar views. Still, tapping public diplomacy to repair relations continued to attract support from both sides. The contribution of people-to-people interactions to improving ties was endorsed by 64.4 percent of the Japanese public and 63.4 percent of its Chinese counterpart. Among the Japanese public who supported public diplomacy, 70.7 percent of them believed that "mutual understanding between the two peoples will be deepened through exchanges", compared with 66.2 percent last year. Similarly, 56.7 percent of those in China who supported public diplomacy believed that people-to-people interactions "expand the foundation for the shared interests of both nations". Professor Akio Takahara of Tokyo University also saw a slight improvement in Chinese people's feelings about Japan. "A large number of Chinese tourists have visited Japan recently and might return home with a good impression of Japan," Takahara said. The number of Chinese mainland travelers to Japan for the first half of this year witnessed a year-on-year increase of 88.2 percent to hit more than 1 million people, figures from the Japan National Tourism Organization showed. In another hopeful sign for deepening mutual understanding, the latest China Daily-Genron NPO poll showed that an increasing number of Chinese intellectuals and members of the public were diversifying their knowledge of their Japanese neighbors through the media. Last year, 14.3 percent of Chinese respondents obtained information regarding Japan directly from Japanese media last year. The figure this year rose to 23.7 percent. When it came to Chinese intellectuals, including university faculty and students, 21.4 percent of them accessed Japan-related information directly from Japanese media. Shi Yinhong, a professor of international relations at Renmin University of China, said strategic and security issues between the two neighbors will continue but tensions will ease. "But the improvement requires appropriate timing and basic conditions. The islands dispute does not represent the full picture of the China-Japan relationship," Shi said. The likelihood of getting the relationship back on track remains, he said. Li Wei, the CASS director, suggested that there was a "shared pursuit between China and Japan - they are both seeking a peaceful rise and not expecting a war". "They both seek security in the Asia-Pacific region and hope to resolve problems in the neighborhood through dialogues within the existing frameworks. That is where the breakthrough may be," Li said. Li also said that the historical and territorial issues are unlikely to be resolved overnight because they are intertwined with each other. These major issues are also not on their wish list when the two sides seek breakthroughs in ties, so efforts to do so should start from less-controversial concerns, Li said.